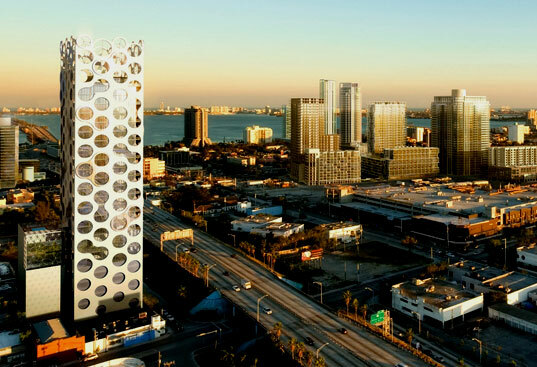 A new high rise is going up in Miami’s design district, and its a lean, green, eco machine. A collaboration between Chad Oppenheim architecture + design, energy consultant Buro Happold, and structural engineer Ysreal Seinuk, the $40 million, 25-story, “COR” building will incorporate mixed-use residential and commercial space, integrating green technologies including wind turbines, photovoltaic panels, and solar hot water generation. The building’s exoskeleton is a hyper-efficient structure that provides thermal mass for insulation, shade for residents, and architectural elements such as terraces and armatures that support turbines. With an aim to attract creative and design-oriented businesses and professionals, the interior of COR features sleek commercial and comfortable residential spaces ranging from $400,000 to $2 million. Each residential unit will include Energy Star appliances, recycled glass tile flooring, and bamboo-lined hallways. In total, COR will play host to 113 residential units, 20,100 square feet of office space and 5,400 square feet of retail space (which already includes a café and furniture store). Estimated completion is scheduled for 2009, with the ground breaking ceremony in July of 2007. So...has this building been nixed? What is the name of that building's facade material? Love this site and projects featured. Found this and even Oppenheim own site shows construction in 2010. Perhaps better to consider waiting to post projects that are real rather than not-even-to -point-of-actually-being built concepts, so as not to confuse the two. This is a very beautiful deisgn and i would love to visit this. I think it will attract many visitors because of the building's unique design. Good can i know some more @ it? I understand the forming contractor is using chinese panels that are not FSC ceritfied and have a terrible record regarding formaldehyde release. The reason why you cannot find any legit information on this project any longer is because this project is not approved to be built and will never get approval for construction. I live in Miami FL where this proposed project was to be built and have gone to many of the architect's presentations. This is all just fanciful thinking and a great PR stunt by the architect [Chad] to get his name out there in the green design community. The architect never expected for this project to go through. In my opinion this article should be taken down. Do the wall curtain frames really look like that?! I mean such a cool design needs more . Please build anything that isn't the same crapola that's been infesting this town the last few years. I love the idea!!! But it looks like a piece of a childs Erector Set or Maybe a wine rack. I think the design could have been more pleasing to the eye!!! I am an architect and happen to live in Miami . I know this office very well and have friends who work there. I have to tell you that you should research your projects a bit more. This is a prime example of green washing. The project is not going to be built and was using the whole "green" idea as a marketing tool. The whole project is not going forward, is too expensive to build and is also questionable use of wind power in an urban context. We like this design a lot, and have been working on more conical tower designs with lots of portholes or other fenestrate openings ala mico sea creatures, see site. There are still a lot of problems with high powered windturbines and buildings, they are incredibly noisy with unconfortable irregular vibrations. Local codes in Palm Springs Ca require very large setbacks from residents. But small 12 volt windmills, like at Mike's Windmill Shop in Showlow AZ could make much nicer window sized powerplants with proper cowlings and safety screens. To get to real power, the diameter is probably too large for window looking openings. Perhaps some sort of wind scoopes could duct to horizontal turbines on the roof? The Chinese are making a wide variety of efficient designed windmills, some of which may apply to this problem. The can also pump water quite well. Has there been a high-rise building actually built yet with integrated wind turbines? I keep seeing these in designs, but not built. From an engineering point of view, there will need to be some serious vibration dampers on the turbines. Has anyone done any studies yet? I am interested to see one built since this is sort of uncharted teritory. just posted alink to you on my site re: this building. Love the site and love the building!! Beautiful and novel designs. Two buidings seem pictured. Are there two, or is the second smaller building an extension of the first ? The smaller extension, if that's what it is, seems to employ a design pattern that's a replica of the 'Flower of Life' , or 6 intersecting circles fitting within a hexagon shaped area. It's fascinating and interesting to see this design used this way. It's also interesting to see it make 90º turns and keep going. I have one concern though. How will the windows of the smaller building employing this 'Flower of Life' framework have its windows cleaned ? Nice concept ! Pioneering approach, I think many wil follow it in coming future. This is an interesting design for an highrise, but I think it would stick out too much in maimi where there are few buildings that complement that design. I'm not saying that it would be bad for maimi to have a building with such design, but the rest of the city would have to change to incoporate that design like in Tokyo. I live in Miami and haven't heard a peep about this building. Has this been confirmed by the Miami commission? Is there a link to the building site? Is there anyway to confirm this project outside this site? Thanks! Seinuk is one cool cat. Structures professor. I never get to hear anything about any of his buildings, but they go up all over the place. Interesting idea, but I'm uncertain how aged or out of place it will look 20-30 years down the line. Really I just want someone to build a cheese shaped building next to it. The cheese grater building would then be complete! Although I like the building very much, I really have doubts about the location: next to a highway. But maybe that's just me. A new high rise is going up in Miami's design district, and its a lean, green, eco machine. A collaboration between Chad Oppenheim architecture + design, energy consultant Buro Happold, and structural engineer Ysreal Seinuk, the $40 million, 25-story, "COR" building will incorporate mixed-use residential and commercial space, integrating green technologies including wind turbines, photovoltaic panels, and solar hot water generation. The building's exoskeleton is a hyper-efficient structure that provides thermal mass for insulation, shade for residents, and architectural elements such as terraces and armatures that support turbines.